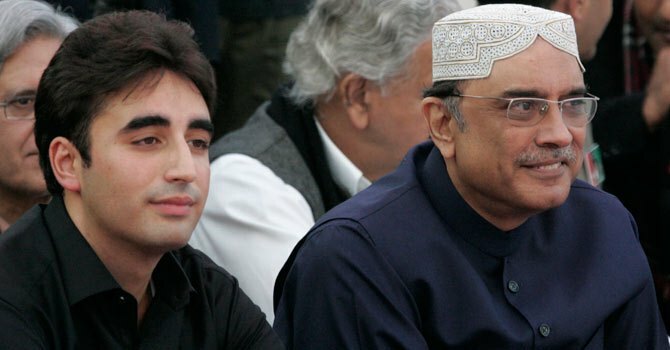 President Asif Ali Zardari on Thursday visited Benazir Bhutto’s grave on the eve of her birth anniversary and laid a floral wreath as PPP Chairman Bilawal Bhutto Zardari urged the PPP to reiterate its commitment to the democratic values Benazir had fought for all her life. President Zardari was accompanied by his younger daughter Aseefa Bhutto Zardari. He also visited the graves of the PPP founder, Zulfikar Ali Bhutto, Nusrat Bhutto, Murtaza Bhutto and Shahnawaz Bhutto. Meanwhile, addressing party workers on the eve of his mother’s birth anniversary, PPP Chairman Bilawal called upon them to reiterate their commitment to the democratic values Benazir had stood and fought for all her life. He reminded them that his mother’s birthday celebrations this year coincided with yet another triumph of democracy and that was the nation witnessing for the first time ever, a peaceful, legal democratic transition in the country. “She strengthened parliament through active participation and refused to listen to those who wanted her to reject the Parliament and adopt the path of agitation,” he said. Bilawal said treading in her footsteps, the party would play an active role as the opposition.